When should you take Colchicine 0.6 mg? If you are experiencing symptoms of gout, which is a type of acute arthritis, you should speak to your doctor about Colchicine 0.6 mg. When you get a prescription for Colchicine 0.6 mg you can order it online from YouDrugstore, an online Canadian pharmacy. When you purchase Colchicine 0.6 mg from YouDrugstore it will be shipped to your home directly from our online pharmacy. Typically, it is recommended that you take a double dose of Colchicine 0.6 mg as soon as the symptoms begin to occur if you are diagnosed with acute gout. Another dose should be taken about an hour later, but usually no more than three doses should be taken within an hour's time. However, if you have recurring gout, it is not uncommon that a doctor will suggest a single dose of Colchicine 0.6 mg a day to prevent further episodes. For those with Familial Mediterranean Fever, 4 doses a day is recommended. Those suffering from Behcet's disease should also take only a single dose daily. How do you order Colchicine 0.6 mg online? 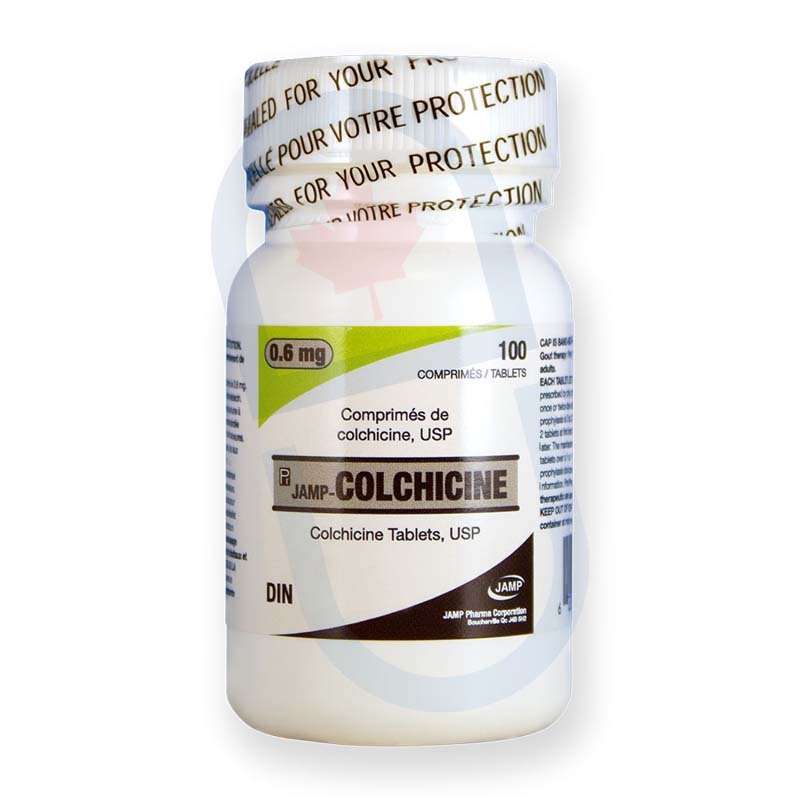 If you are looking to fill your prescription of Colchicine 0.6 mg from your doctor you can order it online from Canada. Simply send YouDrugstore your prescription and our health care team will review and process your order before shipping it right to your mailbox at an affordable shipping rate. 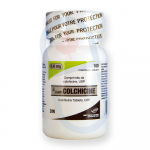 Order Colchicine 0.6 mg today and find relief from your gout at the same price Canadians pay. What are the side effects of Colchicine 0.6 mg? Some typical side effects of Colchicine 0.6 mg include diarrhea, nausea, and stomach pain. There are rare side effects which include fever, headache, swelling, skin irritations, tenderness, sore throat, sores, and unusual fatigue. The side effects or symptoms of an overdose can include bleeding, bloody stool, seizures, and severe muscle weakness. Contact your health care provider immediately if you experience these symptoms. Any other strange or unusual symptoms should also be reported as these may not be all of the possible side effects related to Colchicine 0.6 mg.
Why is Colchicine 0.6 mg prescribed to treat gout? To start, Colchicine is a naturally occurring compound found in plants. Because of this, adverse effects tend to be limited to simple stomach pains at high doses, while it is still effective at low doses. It functions as a mitosis inhibitor, effectively stopping the aggressive activation of cells that occurs in acute arthritis. This results in Colchicine being an effective treatment at low doses, while higher doses become an option if an episode is exceptionally strong. Who might receive a prescription for Colchicine 0.6 mg from their doctor? Doctors commonly prescribe Colchicine 0.6 mg to relieve symptoms of gout, which is a recurring episode of arthritis. An episode of gout usually attacks the joints in the feet, causing a great amount of pain, as well as difficulty walking. Doctors may also prescribe Colchicine for those suffering from Familial Mediterranean Fever, which is a hereditary inflammatory disease, although it is still unclear why it works. Colchicine is effective in treating a number of other disorders, including biliary cirrhosis, sarcoidosis, fibromatosis, aphthous stomatitis, and Behcet's disease. However, Colchicine is most commonly associated with treating gout. If you have a prescription for Colchicine 0.6 mg order it online from YouDrugstore, a Canadian online pharmacy, and get the same rates Canadians pay plus a cheap shipping price. Where can I learn more about Colchicine 0.6 mg?